Bask Represents The Modern Cannabis Experience. A clean, modern facility. Knowledgeable staff. Superior Quality Medicine. 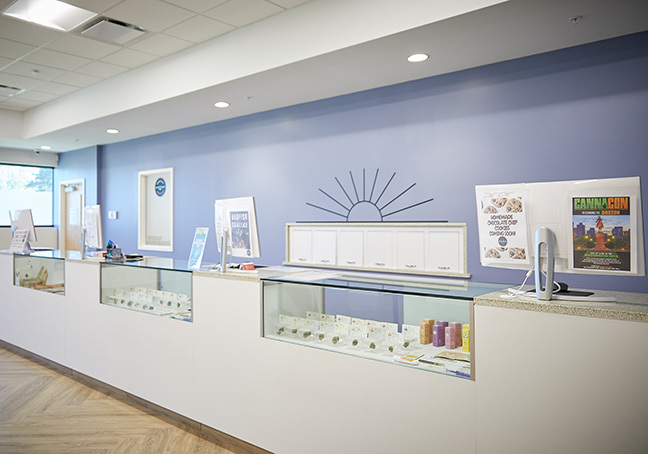 Bask Dispensary in Fairhaven offers patients superior service in a safe, clean, and friendly environment. One-on-one consultations with our patient education specialists are available for registered patients to help find the right products for their symptoms. From seed to sale, our products are kept under the watchful eye of our in-house experts. With over 20 strains grown on site and lab tested, you can trust Bask for any of your medical marijuana needs. Over 20 strains grown on site and lab tested, edibles, topicals, tinctures, and oils. Learn about becoming a patient and about the medicinal use of our cannabis products. Learn about the history of our dispensary and our relentless dedication to quality. THC suppositories provide an effective and discreet way for patients to find relief from pain for hours. Unlike with smoking or edibles, suppositories don’t have an overwhelming psychoactive effect so patients can find relief throughout the day without worrying about peak highs. The bio-availability of suppositories make this method the most effective for absorbing cannabis into your bloodstream. While it may not be the first product patients think of using, suppositories are an excellent option for patients who can’t or do not want to medicate with smoking or edibles and for patients who are looking for hours of pain relief without the psychoactive effect that typically comes from smoking or consuming cannabis products. Fairhaven residents gathered for a Special Town Meeting on Tuesday 11/13 to decide the future of cannabis sales in town. Staff members at Bask attended the meeting and listened as town residents spoke for and against retail cannabis operations. Join our mailing list to be the first to hear about all that Bask has to offer. We announce new products, limited-time sales, and news for our patients.